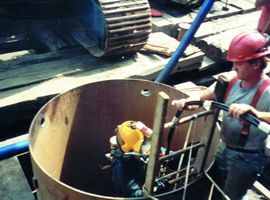 Installation of large caissons and drilling rock sockets a hundred feet below the river bed is a specialty that very few marine contractors can handle. Achieving a proper seal between the caisson shoe and bedrock is the crucial step in building a solid pier. Hudson Marine has inspected caissons of many different depths and sizes. We have the experience to help both the engineer and the contractor in documenting the underwater conditions and choosing options under difficult ground conditions.